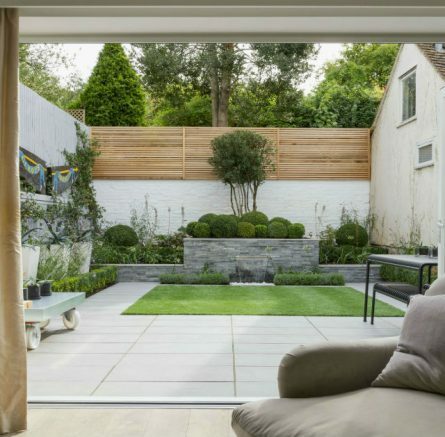 The clients brief was to completely transform the traditional courtyard that we designed and built 16 years ago into a contemporary space. The courtyard was designed into a series of spaces, each to be used differently. 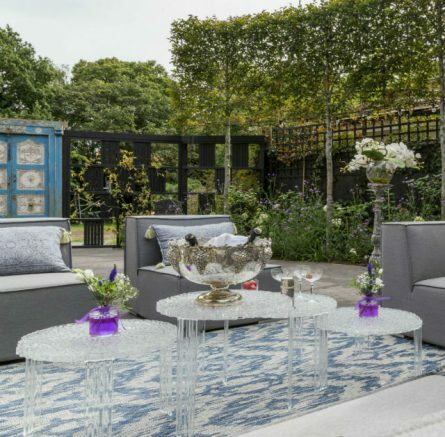 A relaxing area with sofas and a 1.6m long fire table as its centre piece; a sheltered dining space with outdoor kitchen; and an open air dining space. We retained the clipped box hedge as this works really well in a contemporary courtyard. We added to the clipped box and created seamless maturity with specimen plants. 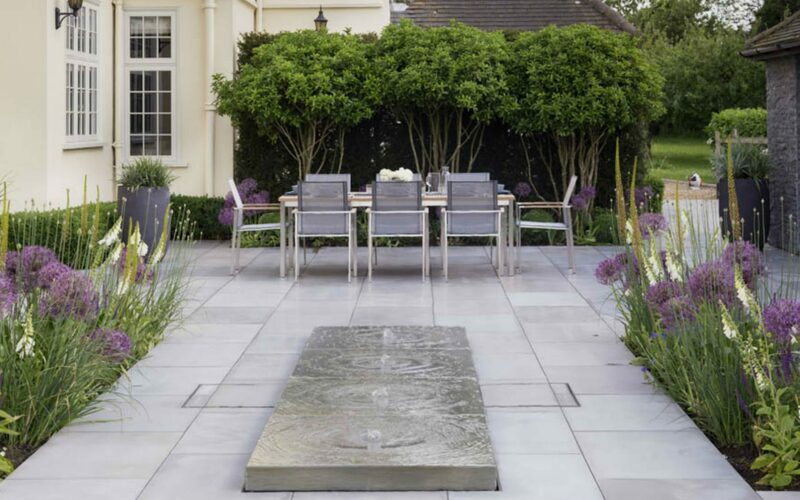 To divide the relaxing area and open air dining space a bespoke large 4m x 1m light grey Yorkstone water was designed. This feature had a self contained metal tank to house the water, pumps and electrics for the fibre optic lighting. 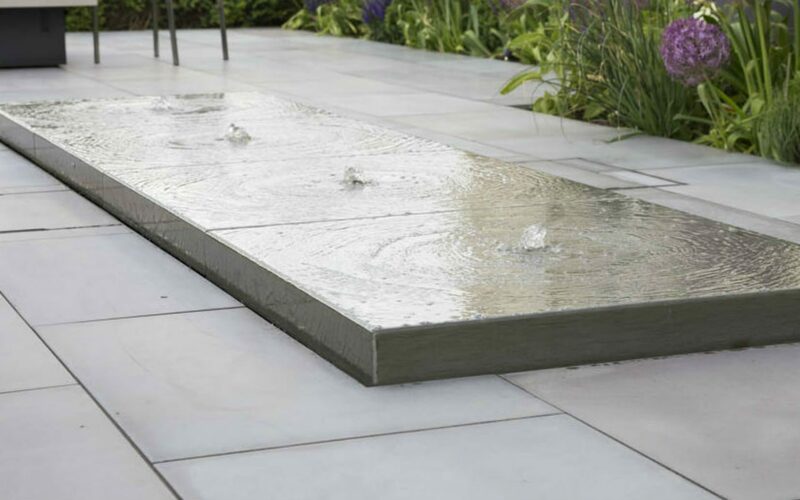 The subtle movement, sound and light makes this feature multi dimensional. Flanked by two parallel flower beds to soften the large expanse of space. 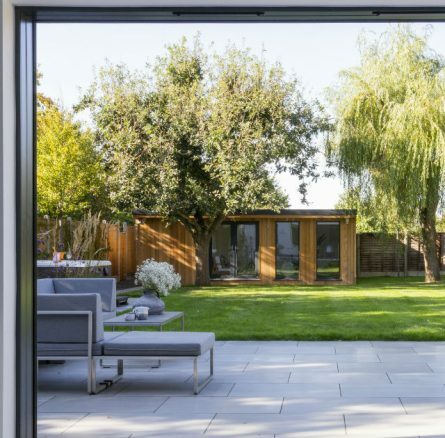 The 100 year old out building was given a makeover by taking out two sets of doors and a centre dividing wall, to create a large outdoor kitchen dining area. Large section oak was cut and put into place to create lintels on either side of the building. Four 250mm x 250mm uprights supported the lintels. A king post was put into the centre and two further decorative trusses to support the pendant lighting. To harmonise the space the continuation of the grey theme was relayed onto the interior walls. They were coated with a Monocouche render with a light grey RAL code. The external walls were covered in a dark grey slate which added much needed texture. The outdoor kitchen comprised of a bespoke built stainless steel work surface, drinks cooler, sink with hot and cold water, storage and a BBQ. To add heat at night or on cooler days two ceramic radiant heaters were placed at either end of the room above head height. 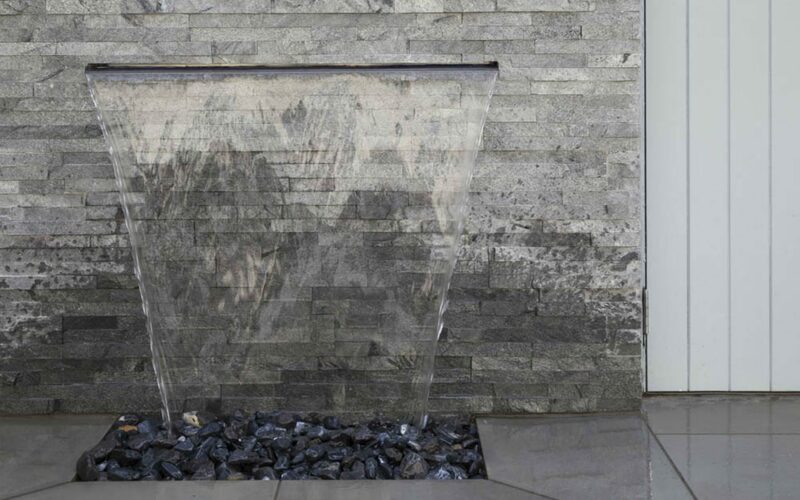 A second water feature was designed into the slate wall. This water blade was back lit and due to the windy site condition, an auto top up tank was also installed. 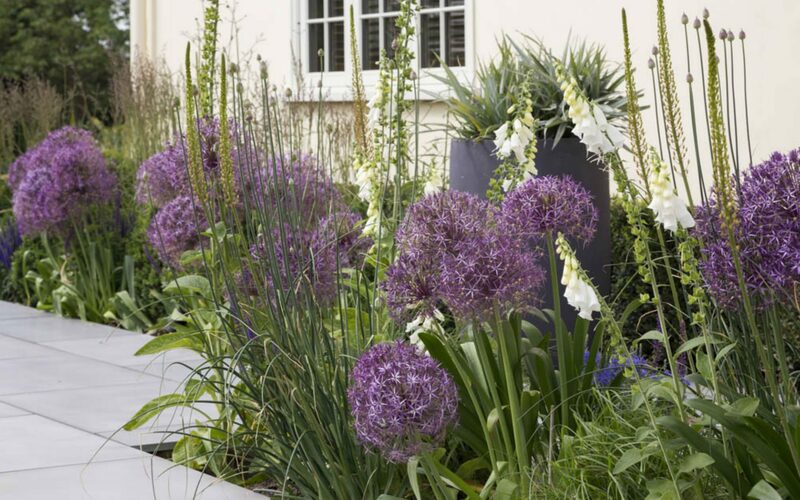 To add texture and height 6 Urbis planters were strategically placed and planted with dwarf Astelia ‘Silver Spear’. The planters were back lit to enhance the mood at night. To screen the boiler room from the courtyard we used 3m high Taxus Bacatta. In front of these we planted multi stemmed Osmanthus Aquifolium, and under planted these with Buxus balls and perennials. Mood lighting was evenly spaced around the courtyard to complete the overall desired effect. BALI National Award Winner 2017. This garden was selected for demonstrating exemplary standards of professional excellence. Every construction and design project was visited personally by a BALI judge, and scrutinised individually. The judges then jointly deliberated each decision to ensure consensus that the winners really do represent the very best in landscape construction and design. 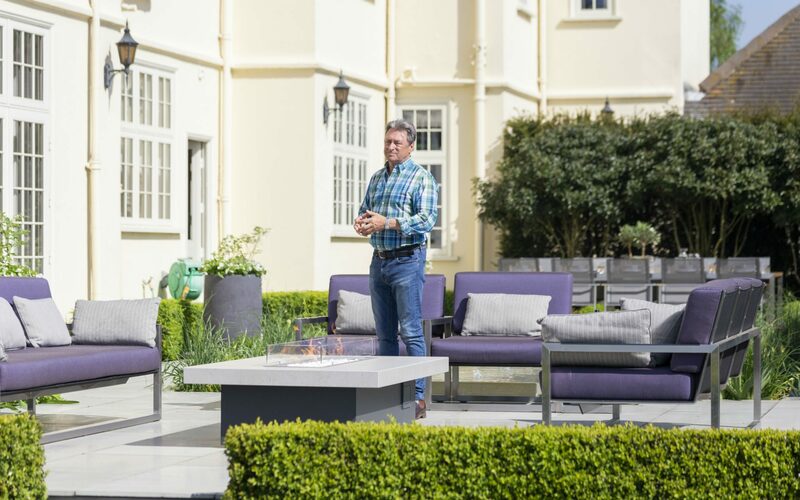 This garden was also chosen to screen on ITV’s Love your Garden with Alan Titchmarsh, as part of it’s Inspirational Gardens Feature. Designed and Built by Cube 1994. 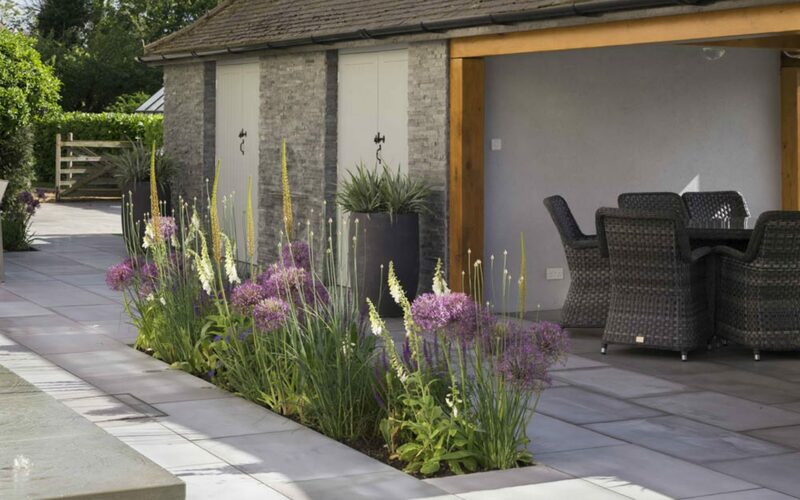 This contemporary garden was described by Alan Titchmarsh as ‘the definition of a designer garden’. 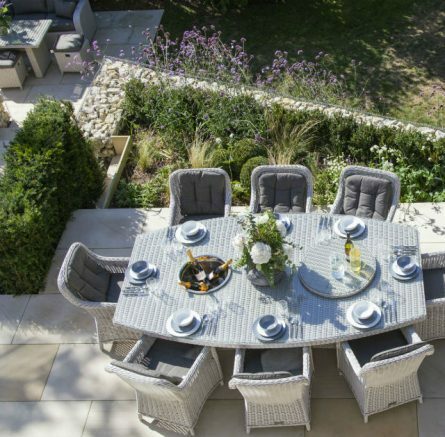 Filled with bespoke features and high-end finishing touches the garden exudes luxury. Watch the video to see the design details close up.